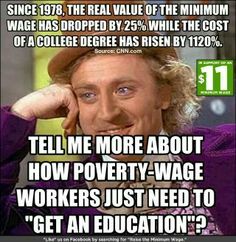 One of the least discussed provisions of the minimum wage law in this country is how we treat workers under the age of 20 – those high school and college students deprecated on FOX News, for example, as overpaid burger flippers, toilet cleaners, gardeners, and other manual workers. The concept of raising their wages to $15 an hour drives most of the GOP and some Democrats up the wall. If you are under 20 and planning to spend most of your summer raising money for college, the thought of even $7.25 an hour (less 50 cents FICA) might sound attractive. So, you agree to your new job of flipping meat for eight hours behind the hot grill without asking about wages, and you assume you will be paid minimum wage of $7.25 or more. The plan is work hard to reduce your student loan debt, especially since college costs go up 5% or more every year. Paid every two weeks, after an exhausting struggle, there is your first paycheck, and something is very wrong. You go to your boss and ask – why is my pay so low? Is this for just one forty-hour week? The employer paid you gross – before taxes – a total of $340. After FICA and state and local taxes, you take home about $300 – and your boss explains it is for 80 hours of work. Welcome to crony capitalism! A minimum wage of not less than $4.25 may be paid to employees under the age of 20 for their first 90 consecutive calendar days of employment with any employer as long as their work does not displace other workers. After 90 consecutive days of employment, or when the worker reaches age 20 (whichever comes first), the worker must receive at least the Federal minimum wage. Just as you are ready to qualify for $7.25 an hour, it’s time to leave your job and go back to school. If you are not in school, the same 90 days rule applies, and if you are deliberately laid off on the 89th day, you will never reach that $7.25 . The 1996 amendments increased the minimum wage to $4.75 an hour on October 1, 1996, and to $5.15 an hour on September 1, 1997. The amendments also established a youth sub minimum wage of $4.25 an hour for newly hired employees under age 20 during their first 90 consecutive calendar days after being hired by their employer; revised the tip credit provisions to allow employers to pay qualifying tipped employees no less than $2.13 per hour if they received the remainder of the statutory minimum wage in tips; set the hourly compensation test for qualifying computer related professional employees at $27.63 an hour; and amended the Portal-to-Portal Act to allow employers and employees to agree on the use of employer-provided vehicles for commuting to and from work, at the beginning and end of the work day, without counting the commuting time as compensable working time if certain conditions are met. Neither the $4.25 youth rate, the $2.13 tipped wage, nor the $27.63 professional floor for exempt workers, has changed in nearly 20 years. That was the plan by Bill Clinton and Newt Gingrich. Promise a minimum wage hike of a few cents, but put no inflation adjustment for the other provisions – the same stealth approach used by Ronald Reagan and Tip O’Neill in the 1983 bill to exempt couples earning less than $32k from paying income tax on Social Security benefits. That number has also not increased over the decades to match COLA. 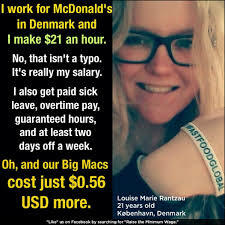 So, when you hear about raising the minimum wage from $7.25 to $15 an hour for burger flippers and high school students, remember that for many of these young people just the $7.25 would be about a 70% raise. Thank you for this sensible post. I keep having those “wait, am I the crazy one?” moments when I read the wrong comment in a thread. Just glad there are some people out there other than Paul Krugman, Bernie Sanders, Elizabeth Warren, and a few others who can do math! I also wanted to point out that there are many of us not so young people out there making much less than the proposed minimum of $15/hour! Saying you are going to pay something and then not doing it is EVIL, but the minimum wage should NOT exist. Minimum wage advocates display wrong thinking.